This page provides information on Corneal Ectasia and the various medical treatment options available. Please take time to view the video animations to better understand this condition and the surgical procedures used to treat it. The cornea is the transparent front part of the eye that covers the iris, pupil, and anterior chamber. Together with the lens, the cornea focuses light into the eye, accounting for approximately two-thirds of the eye’s total ability to focus images. What kind of damage can happen to the cornea? There are many reasons why the cornea can become damaged, including infections, inflammations, degeneration and trauma. Corneal ectasia is caused by irregularities in the cornea that lead to disturbances of vision as a result of astigmatism. The term corneal ectasia can refer to a group of conditions, most notably keratoconus, but can also be related to irregular astigmatism that can develop after a patient undergoes refractive surgery (LASIK or PRK). In both cases, the cornea can continue to bulge, leading to a worsening of vision for the patient. Keratoconus is a condition involving architectural damage to the cornea. The exact causes remain in dispute, but excessive eye rubbing and family history are thought to be strong risk factors. Keratoconus is a slowly progressive condition often resulting in decreased vision or visual distortion in the teens or early twenties. Keratoconus is not typically associated with redness or pain. Some patients may experience the condition in both eyes, but it is far more common for keratoconus to affect one eye more than the other. During the early stages of the disease, the patient’s vision may still be correctable to 20/20 with glasses. Often, the only indication that keratoconus may be present is from corneal measurements or a corneal topography map. A topographical map of the cornea will reveal the high and low spots, much as a topographical map of the earth will show mountains and oceans. As the disease progresses, glasses will no longer correct the patient’s vision. The corneal tissue will thin and start bulging even more. 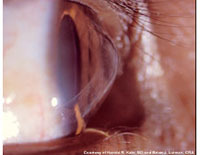 In severe cases, a temporary painful condition known as acute hydrops may occur, in which water rushes into the thinned area of the cornea, resulting in severe scarring. About 1/ 2000 people will develop keratoconus, with most suffering from a mild or moderate form of the disease. Less than 10% of keratoconus patients will develop the most severe form of the condition. Diagnosis typically occurs in the late teens or twenties, but people have also been diagnosed in their mid to late thirties, although by this age this usually involves a more mild form of the disease. It is common for one eye to be affected faster than the other and also for the eyes to go for long periods without any significant change, before altering dramatically over a period of months. What treatment options are available for Corneal Ectasia? A glasses prescription will often be sufficient for patients with mild forms of keratoconus. However, as the condition progresses, glasses will no longer be able to improve vision, due the significant irregularity in the cornea. Contact lenses are available in either hard or soft varieties. The majority of patients with keratoconus will resort to wearing hard contact lenses to improve their vision, since these types of lenses can better deal with the irregularity of the cornea. For the majority of patients, this is their main method of maintaining good vision. However, as the condition continues to develop, patients will need to have new contact lenses fitted and their prescriptions will need to keep up with the progressive nature of keratoconus. In some patients, the irregularity of the cornea becomes so pronounced, that contact lenses can no longer help. This procedure is relatively new and was developed in Germany by Professor Theo Seiler. The procedure involves using Riboflavin drops in conjunction with ultraviolet light, to create ‘cross links’ in the corneal architecture to strengthen the cornea itself. This essentially stops the keratoconus from progressing, with evidence showing a reduction in the amount of irregularity resulting from keratoconus after this procedure. Your doctor will normally offer this treatment with the aim of halting the progression of keratoconus, prior to you requiring further contact lens fittings or a corneal transplant. As with any surgical procedure, corneal cross linking involves a certain amount of risk. Your doctor will provide you with a thorough explanation of all the possible issues that may occur. The major risks involve infections and corneal haze, which can potentially result in worse vision than you had before the procedure, although if this is the case, you may still be a candidate for corneal transplantation. 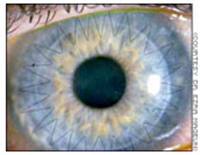 INTACS are semicircular plastic rings that can be inserted within the cornea. These can reduce the irregularity of the cornea, thus allowing the patient to continue wearing either glasses or contact lenses to see. However, INTACS does not stop development of the bulging process and patients may still eventually require a corneal transplant. A corneal transplant involves removing the damaged irregular cornea and replacing it with a donor cornea. Two methods are currently employed for this procedure. This technique involves fully removing the damaged cornea and replacing it with one from a donor. The replacement cornea is sutured to the patient’s eye. Recovery from this type of surgery can take six months or longer. Deep anterior lamellar keratoplasty Pioneered by Dr. Anwar, this highly technical procedure removes only the damaged part of the cornea, replacing it with a donor cornea of a lesser thickness than is the case with penetrating keratoplasty. This procedure minimizes the complication rate, but also carries the risk of the patient developing corneal haze, which can potentially limit the vision. In addition, DALK is a technically demanding procedure with a higher risk of failure. However, in the event of failure, the surgeon can usually easily convert the procedure to a penetrating keratoplasty with no adverse consequences. What happens during Corneal Cross Linking? Itching and mild discomfort are normal after corneal cross linking and some fluid discharge is also common. Your eye may be sensitive to light and touch. Please note that its very common to experience discomfort on the first day of your corneal cross linking procedure but the discomfort improves with the medications given and by the next day. If you do experience discomfort and concerned, your doctor will give you his contact information so you can directly call him. You will be seen by your doctor the next day to ensure the eye is healing well. You will need to refer to the instruction sheet provided by your doctor with instructions on how often you should use the eye drops. If you’re unsure how to use them, you must ask the doctor or one of his associates. You will need to wear an eye shield or eyeglasses to help protect your eye, plus avoid rubbing or pressing on your eye. For a few months after Corneal cross linking, the vision might be less than prior to the procedure. This however usually comes back to either baseline or potentially better than before the procedure. You will be required to use artificial tears on a regular basis for atleast one month after the procedure. You may resume wearing your contact lenses after 2 months from performing the procedure however Dr. Al-Ghoul prefers if you wait up to 3 months if possible. Please note that once your surgeon has removed the bandage contact lens at approximately one week from the procedure, you should be able to resume all your regular activities. In most cases, healing will be continue to occur gradually over a period of six to twelve months, during which time your doctor will schedule examinations to assess your progress. Can problems develop after corneal cross linking? Problems after corneal cross linking are rare, but they can occur. These problems can include infection, inflammation, raised intraocular pressure, corneal haze and rarely corneal edema and decompensation. With prompt medical attention, most of these problems can usually be treated successfully. Please note that doing corneal cross linking does NOT prevent you from benefiting from corneal transplantation if needed in the future. The healing eye needs time to adjust so that it can focus properly with the other eye, especially if the other eye has a similar condition. Ask your doctor when you are able to resume driving. Most patients will notice their vision return to baseline over several months but potentially longer. In some patients there will be slight improvement of vision noted however that is not the primary intention of the procedure. Please note that the goal of corneal cross linking is to stabilize the cornea and is not intended to necessarily improve the vision. Is Corneal Cross Linking required for all patients with ectasia? Corneal Cross Linking is intended for patients who have evidence of progression from ectasia condition and is NOT for everyone with ectasia. Only your surgeon will be able to assess whether you are a suitable candidate for this procedure. How was this procedure invented? Corneal cross linking was invented by Dr. Theo Seiler, a world renowned Ophthalmologist. He along with Dr. Spoerl a basic scientist investigated various techniques in the laboratory setting to strengthen corneal collagen molecules. After extensive studies done in laboratory and clinical studies, they found that Ultraviolet light in conjunction with Riboflavin produces increased strength to collagen molecules in the cornea. This in turn led to the discovery of corneal cross linking as procedure to halt Keratoconus and other ectatic conditions. It is estimated that to date there have been 70000 procedures done world wide. 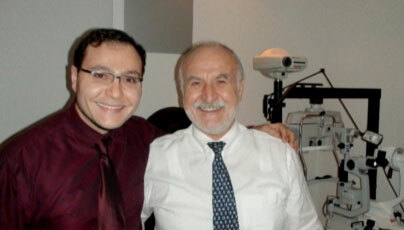 Dr. Al-Ghoul has had the pleasure of learning directly under the guidance of Dr. Theo Seiler in Zurich, Switzerland. He was the first ophthalmologist in Alberta to introduce this technique. This procedure is now being done throughout Canada.